I think common language could be a unifying influence, but it would be subject to the same sorts of fractious problems we have seen since it became possible to speak of a Kemetic community. We would all have to agree on how words were pronounced at the very least, and we already know there are a ton of people who will reject certain translations just because they don’t want the translator to be correct despite her many years of tested and proven expertise. That doesn’t mean that making a truly common language is not something to pursue, but I don’t think it gets at the core reasons for the community being fractured. Communities need both “little” and “big.” With only one, the community is unbalanced and less effective (either too “little” with no guidance, or too “big” with no life). They both have vital things to contribute to the whole and they both benefit each other. The “big” people convey wisdom and guide by experience and tradition (which is itself an excellent teacher). The “little” people bring curiosity that forces the “big” to keep rethinking what they teach, enthusiasm, fresh eyes, and the joy of discovery that is often lost in the rote of decades of practice. Both teach and challenge each other, but not if either is coming from a place of fear or insecurity or jealousy. When that’s the case we get what we have now, this strange sort of competition of various kinds of people putting each other down or undermining each other more often than anything else. So then no one is getting the benefits from the other and everyone is unhappy because we actually need those benefits. Basically, we all, each and every one of us, have to grow up. Until we stop being afraid that someone has more or better cookies than we do, I don’t know that there is going to be an improvement no matter what tactics we use. Emotional maturity is the only cure for the endless wailing of “ur doin it rong.” Less focus on consensus and more on tolerance and appreciating our differences, less and ego-protectiveness and more listening to each other to actually learn who everyone is and understand their perspectives better. We are not threats to each other, and I am certain that every one of us, no matter how “big” has plenty to learn from everyone else. Thank you for your thoughtful reply. And you do have a bit of a point about factionalization. I don’t feel, however, that it would be much different than the different dialects that were spoken in the various nomes and geographical locations in antiquity. Certainly the language changed several times – and Sahidic Coptic is pretty much Greekified Kemetic. I would view it similarly to the various dialects of Arabic, or French. Egyptian Arabic sounds nothing like Saudi or Syrian dialects. The Egyptian dialect still has many loan words from antiquity, which I have always thought made it far more special in its way. Also, European French and Québécoise are different in many ways – and so is the approach to the language in others learning how to say it.French speakers in France tend to forget that their own European dialect evolved and Québécoise still has a great deal more in common with Archaic, 17th Century French than the modern European version does. In my view, those are all little issues, and you are right, it does not get to the core factionalization of the Kemetic community. I like your observation about Western people and would add that the pettiness, the bitterness and the constant competition and jealousy is far more prevalent in the U.S. than in Europe, Central America, Africa or anywhere else. I am not sure why that is, other than perhaps the left over idea of breaking away from large religious organizations or theocracies. I do have memory of the largest Kemetic group when it just started out. By the time I joined we were less than a dozen people in an AOL chat room once a week. In a few short years’ time, it had grown and grown to the point where it was getting overwhelming. After having been a part of the larger structure in the priesthood, and later stepping down to go to school, I have to say that everyone has something to contribute. We are all shemsu. As we used to say often in the House, “It’s about God, Stupid.” To everyone at the “top”, especially within the priesthood, it was made abundantly clear that we were little more than Roadies for God. That means, we lump Their luggage, Their, stuff and make sure THEIR SHOW goes off with as few hitches as possible. The moment anyone forgets this *fact* is when they are disconnected from what its about – what it has always been about since antiquity. It’s about Netjer. We get to come to the party, but it is still Their party. The realization of that, in my opinion, is what separates the grownups from the attention-seeking brats. We all do have plenty to teach each other. As I a fond of saying, none of us individually knows anywhere near as much as all of us do collectively. It is that collectivism that I am going for. If Arnold Vosloo, Rachel Weisz, Dwayne Johnson, James Spader and Patricia Valesquez could all learn a phoneticized Kemetic, and do it well enough to deliver their lines convincingly, there is no reason why it cannot be done more for more practical purposes for we who are Kemetic. We don’t need to decide if we want Middle Egyptian, though that would be the easiest, or Sahidic Coptic, or something that the Afrocentrists are currently using. Like the aforementioned Arabic and French dialects, there are basics that can still be conveyed. We lose nothing by trying and this would not be a for-profit in terms of monetary or even pubic relations exposure. It is something to focus on other than worrying about who is big, who is little, who is important enough, degreed enough, or the right colour or ethnicity. This is about the fact that all of us love the Ancient Kemetic culture and we could, if things keep going as they are with the fundamentalist factions in the region, see the utter destruction of the artifacts and monuments. I for one do not ever want to see that happen. We cannot sit idly by. The more we immerse ourselves in what it is that we love with our whole hearts, the greater our chances at success will be. We who have a vested interest will be less likely, I am thinking, to worry about what separates us and more about the things we have in common and what it is we are all trying to accomplish. I have been lurking for the past few years through the various Kemetic blogs and forums, and your concerns over the division over a unified Kemetic Orthodoxy has confirmed my feelings towards my own place within the grace of the Neteru. I believe the division within the kemetic orthoxy is ultimately a result of within the cultures we come from in which, at its backbone, feelings towards a higher power is enforced through an organized religion which deems itself separate from the material and socio-cultural world. Unfortunately, as far as any revivalist/reconsctructionist neo/post-pagan belief system goes, we have an innate desire to form an insulated community of fellow believers to affirm, establish and re-enforce our beliefs in the face of a world which is anti-polytheistic, christian, or atheist. However, unlike Christianity which began to evolve from a circle of beliefs not bound to a union to their god based on geographic/cultural/economic inspiration and disavowes these elements in human nature, those who follow the neteru (or any polytheistic belief structure) are attempting to recreate a belief structure based on spiritual beliefs which have always been bound or inspired by the geographic/socio-cultural/economic realities. Unfortunately for us, the return of the gods from previously Christianized regions have returned to the minds of whomever they have touched in a world which is indeed different from the 1000+++++ years which the various gods had realized their continued active presence could no longer possibly be maintained without human rationality losing sight of their offering. In essence this has forced many of us wishing for that sense of community among similarly believing individuals to adopt an organized religious mindset not very much different from Christianity in function. It doesn’t help that the clues the neteru left for us are incomplete, badly damaged and in a language which has died mellenias ago.Add to this what has survived in writing are mostly prayers, as much of how the neteru were worshiped I would assume was orally transmitted and innately known by the culture (why write how to pray if everyone knows how). However where there is organized religion, their is a power structure to justify it, and such power unfortunately attracts those who seek it. Not that everyone who is a believer of the Neteru seeks power, but since their is no wider cultural structure which aids in defining who is or isn’t correct in their perspective (or if their should be a multifaceted perspective), what real system is their to prevent politicization outside of the the concept of Ma’at. Unfortunately I believe we wold need much more than simply a shared language to unite all Kemetists. Countries with similar languages enact civil wars, Latin America as its name is defined by whether a country speaks Spanish or Portuguese, and countries of those respective languages are not united political entities. Even the middle-east, with a shared language (either as native or religious toung and yes I know which countries speak Arab, Persian, and Urdu), a shared mono-theistic religion, and a common “enemy” (referring to Israel) and still these countries are politically and often times religiously divided. My point is that there are infinite amounts of factors which divide people, outside of a unified belief structure. Even, if we found a location where we started anew, separate from the woes and demands of the modern world, and created a culture from which we raised our children and descendants to live for all eternity and their would still be quarrels. 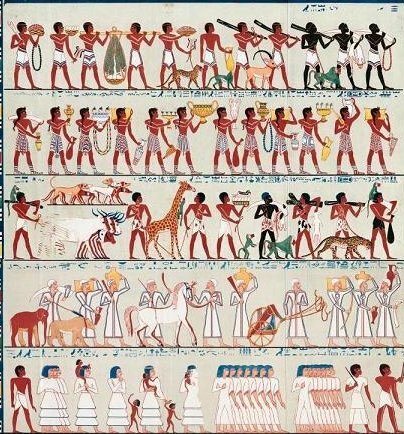 Ancient Egypt had plenty of quarrels and obviously the Unification of the two kingdoms must have had caused misery for many of the denizens of Egypt through war, even though it did serve the interest of the neteru. However, isolation in this world is likely not what the neteru have in mind for their role. However, it is atleast my belief that the neteru have an interest in bringing growth and “goodness” to this world, and for those that they wish to commune with they will, and for those who they believe they can work through, they will influence towards their goals. The interesting about the neteru I find is that they do not seek to destroy all that man has done, but simply refine and transform it into something more in accord with Ma’at. Unfortunately some eggs may need to be broken, and thenNeteru may see that their perceived presence among non-perceivers/worshipers as detrimental to their cause. However, whether your part of an orthodoxy, or a private worshiper, we are all working in the interest of the neteru. They need people to utter dissatisfaction with the system us humans developed, as well as those who are satisfied within their structure and even those who simply acknowledge the neteru play a part in their plan. the neteru have only made themselves apparent to us for a little over s century I feel, and we have come a long way from the seeds they had planted. However we are still in the growing phases and are still in the cultivation stages. I believe the “death” of philosophy and the moderatsasion of psychology has given us the soil necessary to re-approach the neteru anew in a more cohesive sight than never before in modern history. My proposed “unification was not in any way, shape or form about putting every Kemetic practiioner under a Kemetic Orthodoxy framework. My post was a hope for civility among the various factions within the various Kemetic Communities and individual practioners. For me, this shared civility that is not about one-upsmanship, that is not about the modern pseudo politics and would-be empire building. Further, I think that my practices have very little to do with Christianity or any other sort of monotheistic construct. If that is your assumption, then you have not been following my blog too terribly closely. I may be Kemetic Orthodox, and I may be very much a part of a larger temple, but that does not mean that I have given up what I know to be my own individual quest for the Netjeru. As for the linguistic translations. I can tell you from both direct experience and those around me within the field, that the language is not as dead as you think. There are, as we speak, new breakthroughs that have come to light and once those are presented, it is going to change absolutely everything we thought we knew – that is on both the scholarly and the spiritual side. Of course, I have not seen the research, but I do know the researcher, and their work is impeccable – again, on both sides. My post was hoping that maybe, with the combined effort it might help instill civility and cooperation through the various arenas within Kemetic belief. Perhaps it will stop the incessant need of those on different sides of the equation to quit treating each other with disrespect rather than the mutual acknowledgement that it is all about our connection to Netjer, and very little else outside of that, including how we express that matters too terribly much. Maybe it is a futile hope. The absolute bottom line for me is to serve the Netjeru – and it does not necessarily mean I have to be a priest/ess of any sort. Been there done that, I am not sure that I was ever more effective there. My other motivation is to see that Ma’at is served. If I can do that by giving people a potential focus – however futile -then why not? What does it harm to try? Do we collapse in a heap and mourn the long, lost passing of ancient Kemet, or do we take the gifts that we still have – the rites, the wisdom literature, the knowledge and try to cobble something together that is still pertienent to our modern day lives? I say the latter. And I am sticking to that.